One of the things I don't like about blogging is the pressure I place on myself to come up with new things instead of enjoying the same thing year after year and planting it as a tradition in the hearts of my children. I know I am not alone! Why are we tempted to think that what has been said already can't be said again? Second verse, same as the first! On the other hand, keeping a blog has helped us establish some traditions either by helping me to remember or by helping my children remember to remind me. We decided to do our May Crowning today on the first Sunday of May and many things are repeats traditions that our family has embraced and enjoyed. Our May Crowning tradition is to celebrate the many beautiful titles of Our Lady found in the Litany of Loreto and to pray a Memorare each night for those people who might fall under her patronage through a specific title. You can go see our list here while I dust off the forget-me-not flowers and crowns. We also sing hymns (Sing of Mary is one of our favorites), crown our three Mary statues and place flowers on our May altar. We pray the Litany of Loreto and then enjoy a feast. As for the menu today, some old favorites and some new treats were planned and prepared. I did not make this. We picked it up from the same bakery as last time. It is a Strawberry Boston Cream Cake and it is delicious! 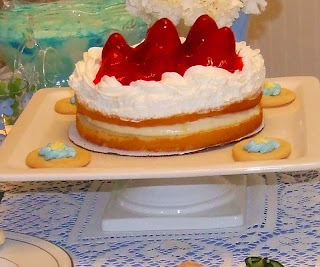 As The Professor said, "The red is for the martyrs and the strawberries on top look like a crown!" Bingo! I did decorate simple sugar cookies again with frosting forget-me-nots as part of our decorative theme. 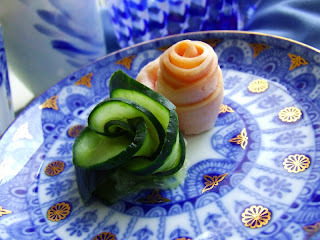 Turkey breast roses and cucumber roses. 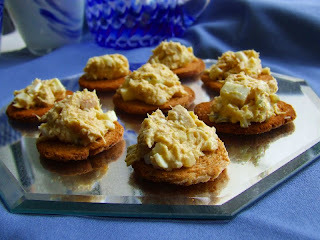 I used the leftover turkey breast from the sandwiches below and a cucumber following these instructions (kind of). For some reason that website takes a long time to come up so wait for it. I think Japanese cucumbers have smaller seed pockets and roll up easier. 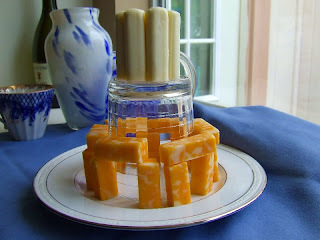 Mine held together only because they were impaled on toothpicks but they did look cool! My kids know that using great-grandma's punch bowl and cups is a huge honor. 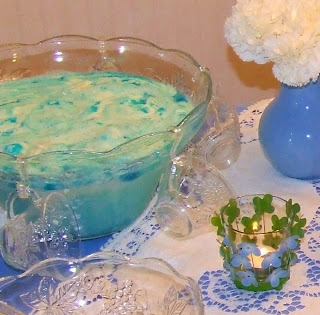 This year, we used 7Up, vanilla ice cream, and one small box of berry blue gelatin (unsweetened if you can find it) to make our Mary Blue Punch. Stir the 7Up and gelatin together until gelatin dissolves. Pour into punch bowl and float vanilla ice cream clouds on top. 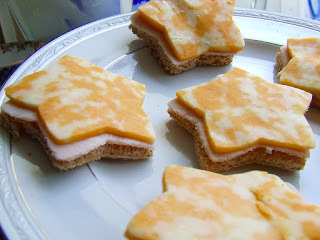 Star shaped turkey and cheese sandwiches (because we ran out of Calla Lilly stems). 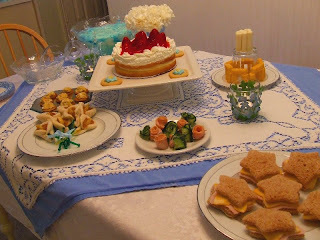 It's all so pretty Charlotte, but I especially love those calla lily sandwiches!! Oh, Mary Blue punch--how clever! That is such a lovely table. I find myself running into the same internal tradition vs. blogging debate. It is a lot of pressure to keep things fresh, so I understand how you feel 100%. 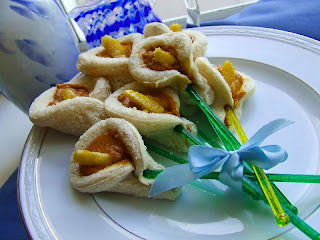 The calla lily sandwiches were the biggest hit by far with the children although all of them picked off the banana before eating. What kid doesn't like peanut butter and banana? Mine apparently! Hi! I just came by your blog and I love it! I would love to follow you, but don't see the "follow" button. Could you stop by my blog FALLING UPWARD and let me know? Also, your coloring pages are amazing. I want to color them and put them up in my daughters' bedroom. Do you have a St. Ann? Thank you for your sweet words! I don't really understand how to do the follow thing so maybe someone else could help you with that. I do not have a St. Anne posted yet, but her feast day is my husband's birthday so I have one in the works.